The Marina Elite complex is nestled on a serene hillside overseeing a stunning bay with a rocky beach on the coast between Puerto Rico and Arguineguin in Gran Canaria. The elevated position gives it a glorious view of the sea. Guests should note, there are many steps around the hotel grounds, therefore it may not be suitable for persons with walking difficulties. 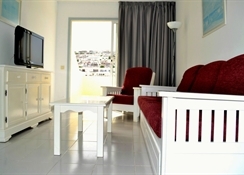 The apartments are comfortable, brightly furnished and most have wonderful views to the ocean. This hotel is located 2.1km from Puerto Rico with its busy marina, pretty beaches and water sports along with plenty of bustling shops, trendy bars and restaurants – there is a vibrant nightlife to be found along the traffic-free promenade. It comprises two outdoor swimming pools, one children’s pool, gym, tennis courts, billiards and much more. 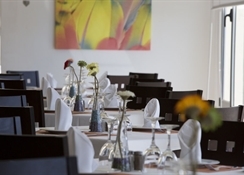 Overall, this resort is a good value for money when you are on a holiday in Gran Canaria. Nestled in Mogan, Las Palmas, Spain, the Marina Elite All Inclusive Resort is about 44km away from the Gran Canaria Airport. Just take a 10-minute taxi-drive (6.8km) to reach the lovely Amadores Beach, which is very popular with beach lovers. Those who want to practice golf can head to the Anti Tauro Golf, which is at a distance of 7.4km. There are plenty of rooms in the resort to accommodate all kinds of travelers. It comprises rooms in the following categories: Standard, Higher, Deluxe, 2 Bedrooms Superior and 2 Standard Bedrooms. Some of the amenities in the rooms include satellite TV, well-equipped kitchen, coffee maker, fridge, microwave, toaster, water heater, hair dryer, bath tub, bathroom with shower, balcony or terrace comprising chairs and tables, In-room service and much more. The resort offers lip smacking delicacies for those guests who don’t want to cook. 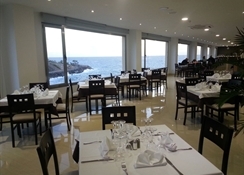 In the resort premises there is a restaurant offering breakfast, lunch and dinner. Grab a bite at the snack bar right next to the upper pool serving refreshing beverages and snacks from morning to afternoon. Other than this, there is a pool bar right next to the lower pool and a beach bar serving alcoholic and non-alcoholic drinks. The resort offers ample sports and leisure facilities to keep guests engaged from sunrise to sunset. Some of the sports and games facilities in the hotel include darts, table tennis, billiards, tennis courts (additional fee) and a high-tech gym. Additionally, there are two outdoor swimming pools (heated in winter), which are ideal for sunbathing and relaxing, where you will also find solarium spaces with umbrellas and sun beds. Kids too can have a lot of fun when their parents are relaxing by the pool, some of the facilities for them include a mini club where great activities are organised by the resorts staff members. We inform you that due to a restructuring in the operation of F & B in our establishment Marina Elite Resort, we are forced to modify the schedule of our restaurant. * Only for guests on an all-inclusive basis. On arrival our room was not ready (we arrived slightly before check in) the staff behind the reception said we could leave our cases and go to the pool if we liked, which we did. Our room was clean and tidy. We had two single beds rather than one double, no problem, we just pushed them together, yes the room was hot but we expected this, we could've spend some euros to buy a fan for the room ut we did not feel the necessity. We had a lovely view of the sea and despite reading reviews of noise pollution we did not notice anything causing us problems. The staff all throughout our staff were polite and friendly. If we wanted to go off site the reception was more than happy to call us a taxi or give us information about booking activities. Okay so WiFi is not readily available apart from a couple of hot spots but then we did not want to be glued to our phones for the whole holiday. We made a point of visiting the WiFi hot-spot by the pool once a day in the evening just to check online at home. Okay so if I had to make one mistake or complaint it would be that not all the food in the reatraunt was labelled. My boyfriend nearly ate a fish dish when he is highly allergic to fish so more labelling would have been better. The food was perfectly acceptable for an all inclusive resort. All in all we really enjoyed our stay at the marina elite hotel and we would happily return in the future. This hotel is in a very good location. With great facilities and pools are great. Food is basic but good wide range of food. I ate in the restaurant rather than the top buffet. Beach bar is lovely at night. Would definitely go again only difficulty is trying to find you room and walking up all the stairs. A pleasant stay overall, nothing bad, just a few things could be improved but for the price we payed it was a good deal! Quite a basic hotel food was alright but not great. Need your hiking boots to get to the pool.